Stacey Cafaldo - STEER FOR STUDENT ATHLETES INC.
Stacey Cafaldo, daughter of Paul and Sheri Wolff was raised in Plainview, NY with her twin brother. Her parents did an excellent job of making her understand the importance of a great education but also being an ever better person. Her parents spent many hours on the sideline of soccer and basketball games helping Stacey realize the important life lessons athletics can teach. Stacey focused on soccer and basketball and participated in numerous travel teams when she was growing up. Sports were a staple in Stacey’s four years of high school. She was a member of the Varsity soccer team and Varsity Basketball team at Plainview Old Bethpage JFK High School in Plainview, New York. More importantly she used athletics as a means to helping her community. She was the Vice President of Athletes Helping Athletes which allowed her to mentor younger athletes. It was this experience plus so many others that let her to studying Human Development at Binghamton University. After Binghamton, she went on to get her first Master’s in School Counseling at Hunter College. Her second Master’s degree is also from Hunter College in School Administration and Supervision. She is a New York State Permanent certified school counselor as well as a School District Leader and School Building Leader. Stacey Wolff is currently in her eight year as a school counselor at Port Chester High School. In her role as a school counselor, she addresses all students’ academic, career and personal/social development needs. She also assists her students, many of whom are first generation to attend college with the entire college application process. She has also been a presence in the school community as advisor for the Student Senate and Habitat for Humanity which works on positive changes for the school including increasing school spirit. 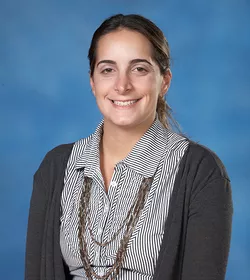 She is also the CAS(Community Action Service) advisor for students seeking the International Baccalaureate Diploma at Port Chester High School. She is co advisor of Senior Scholarship Night which awards over $100,000 dollars in scholarships for our graduating senior class.